Earlier this month, a medium-sized meteoroid entered Earth’s atmosphere, leading to an explosion over the Russian city of Chelyabinsk that blew out windows, caused walls to collapse, and injured more than 1,000 people with flying glass shards.The fireball was well-documented by Russians, largely due to the widespread use of dashboard cameras. 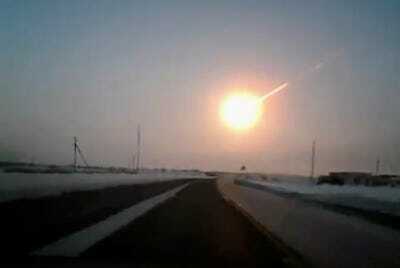 A team from Columbia has now used amateur video footage to track down the meteoroid’s origin. Their research was published online Tuesday, Feb. 26, on Arxiv.org, a website on which scientists share their research before it is peer-reviewed. Researchers calculated the trajectory of the meteoroid once it hit our planet’s atmosphere using trigonometry. They used this to reconstruct the orbit of the meteoroid in space before it hit Earth. Researchers used astronomy software, according to the BBC, to trace the meteoroid to a family of near-Earth asteroids known as the Apollo asteroids, their distinguishing factor being they cross Earth’s orbit. They make up more than half of the near-Earth (and potential problem-causing) asteroids discovered so far. “Although semimajor axis and inclination of the preliminary orbit computed by us are uncertain, the rest of orbital elements are well constrained in this preliminary reconstruction,” the scientists write.